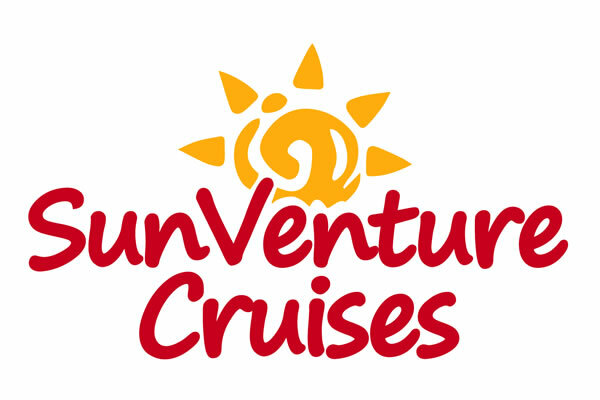 SunVenture Cruises today announced that it has received a Tripadvisor Certificate of Excellence award for the second consecutive year. The achievement celebrates businesses that have earned great traveler reviews on Tripadvisor over the past year. SunVenture Cruises has been recognized for continually delivering a quality customer service experience for its daily Crab Island, Sunset / Dolphin and Fireworks Harbor Cruises in Destin Florida. Established in 2012, SunVenture Cruises offers a variety of daily cruises from the Destin Harbor with Coast Guard-licensed captains. The daily Crab Island cruises are the most popular, offering a three-hour excursion where guests have access to their own beverages, an on-board restroom and continuous boat access. Guest reviews highlight the safety, value and convenience of the Crab Island Cruise as well as the entertaining and helpful captains and the overall Crab Island experience. Other SunVenture cruises are reviewed on TripAdvisor as well. The SunVenture’s intimate atmosphere offers the closest views of the dolphins on its daily Sunset and Dolphin cruise. Every Thursday night, the SunVenture offers a special Harbor Fireworks Cruise that explores the Destin Harbor as the sky above illuminates with bright lights. The SunVenture is also available for private charters for up to 49 people. Guests can rent the boat and the captain for any occasion, including brunches, birthday parties, bachelor/bachelorette parties, corporate retreats and more. The state-of-the-art sound system and open deck arrangement offers a memorable celebration on the water. Event planners and catering packages are also available. Thank you for helping us achieve this tremendous award. 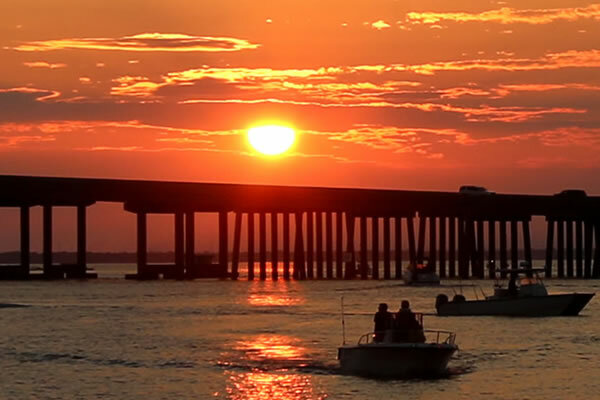 If you are interested in our Destin cruises, we would welcome the opportunity to spoil you on the water! View our schedule here. Summer 2013 is ‘unofficially’ over and we’re on the heels of another spectacular fall season. It truly is one of the best times of the year to visit for many reasons. Less humidity, lower rates, smaller crowds, less traffic, migrating butterflies….we could go on and on. Our regular cruise schedule is dwindling down as well but Captain Rick is always looking for an excuse to get on the water. The SunVenture is available throughout the fall for any private cruises for up to 49 people. We can accommodate anything from catering to Crab Island excursions. Just ask and we can make it happen. Many of our guests have found that the SunVenture makes for a fun, unique ‘venture’ for anything from corporate retreats, activities during business conferences, girls’ weekends and more. If you are fortunate enough to visit Destin Florida in the fall, give us shout and we’ll help you cruise through a memorable fall ‘venture’ in Destin. Last week, we talked about how you deserve to play as hard as you work. Hitting the water is one of the most popular ways to not only enjoy the Destin life, but a very relaxing way to spend time with family and friends. Relaxing, that is, for everyone who is NOT driving the boat. You can rent the boat and the captain on the SunVenture. Sit back and relax while Captain Rick charters the waters, gives you an entertaining narrative of the Destin life and drops anchor at Crab Island. It’s a worry-free day on the water that everyone deserves. We’ll even bring food! The SunVenture can host up to 49 people for any private charter to see the dolphins, sunset, Crab Island or anywhere else along the local waters. Life is short….live it up worry free on the SunVenture! ­For a lot of people, Labor Day means two things: a day off and the end of summer. But why is it called Labor Day? Labor Day is a day set aside to pay tribute to working men and women….that would be YOU! Whether you work 9 – 5, 80 hours a week or 24/7 as a stay at home mom, you work hard and deserve to play hard. We all know there’s only one place in Destin Florida to relax this Labor Day weekend…..the one and only Crab Island. You can truly take the weekend off by renting the boat AND the captain on the SunVenture. Captain Rick is ready to host you and hit the water as he navigates the seas and let’s you enjoy a safe day of cruising in the sun. 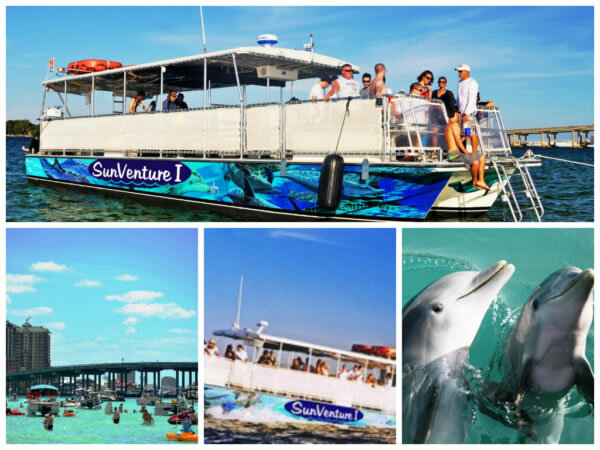 From private cruises for up to 49 to dolphin/sunset and Crab Island cruises, the SunVenture can make this a Labor Day in Destin Florida to remember. Join us! Sundays are a day of respite…a time to unwind and relax before another hectic week. How would you like to spend the day relaxing here? This is Crab Island, the ultimate spot to celebrate Sunday Funday. It’s a day of chilling on the boat, listening to music, lying in the sun and mingling in the waist-deep, emerald green water with friends. You’ll find people walking through the water or relaxing on a float. There’s seriously no other place like it. If you’re driving the boat, then there’s not much fun or relaxing in the picture. Venture aboard the SunVenture and let Captain Rick do the driving while you have fun in the sun. Join us this Sunday!